A few weeks ago I was visiting my fashionista friend Allie, from A Tonk's Tail...you know, the one with the pawsome pink mani-pedi? Well she turned me onto this fabulous find from Eclectic Pillows. When I saw that Sara Klassen, the artist behind the pillows, had actually used MY own profile to create them...well I just knew that Glogirly had to have them. And it didn't hurt they matched her new rug. 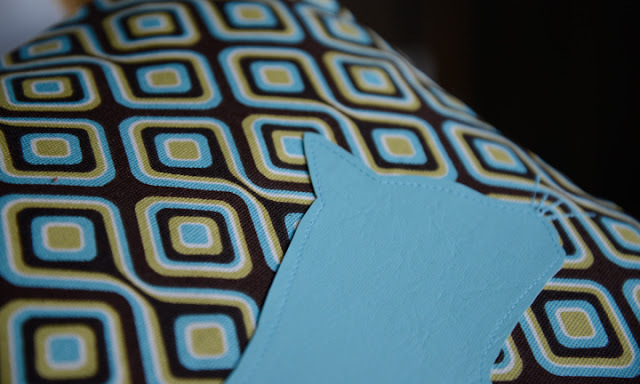 The pillow covers are made from a hip midcentury modern upholstery fabric with a leatherette kitty silhouette applique. The kitty even has whiskers. They're almost as beautiful as me. Almost. 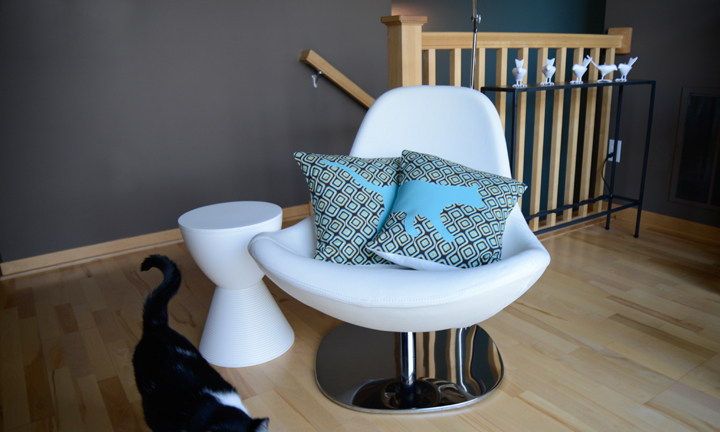 Sara has a cute little Etsy Shop with some black & white kitty pillows we also adore. Now if I can just move these pillows to a chair that doesn't spin around every time I jump onto it. I've never been much for amusement park rides. 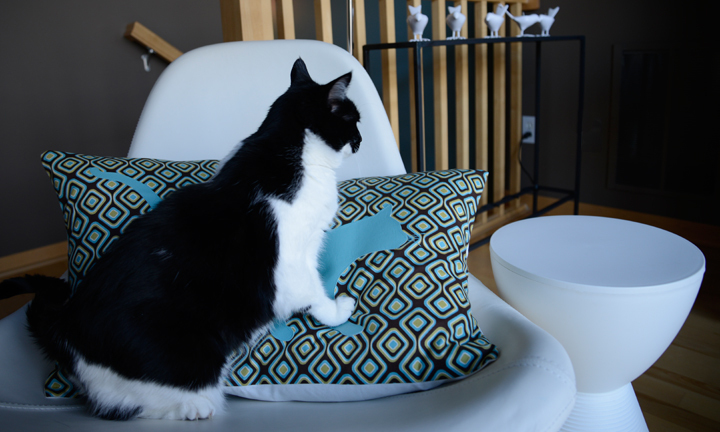 Thank you, Sara & Eclectic Pillows...we LOVE our Kitty, I mean Katie Pillows. You are doing it all wrong Katie! You're not supposed to jump up to the pillows! You should throw them down on the floor THEN jump on them! Cute pillows, but how could they be anything but, with you for the model? Katie, can you believe my crazy human actually likes that chair?! Heh. I'm with you - give me a comfy, non-moving chair anytime to go with those awesome pillows! Pawsome pillow! We don't think chairs should move either! Katie, your home looks so modern and fashionable! Pawsome Katie. BOL funny re the spinning chairs. Have a terrific Tuesday. We like the way the whole kitty covers 2 pillows! Those pillows are great! And we bet they're comfy to lay on too, Katie! What fun pillows...we're going right over to check them out. i have the same birdie candle holders! Those are kewl but a moving chair?!?! Where was the new rug? Heh! Allie: *squee! * Aren't they simply DIVINE?!? I ordered PINK but Mother said something about coordinating and decor and I just tuned her out. Surely she wouldn't have CHANGED my ORDER...you think? WOW - your lucky find,. Furry cool pillow indeed Katie ! WOW---those are some spiffy lookin' pillows--lucky you!! Those pillows and that chair go together PERFECTLY! Those are pretty cool, Katie. Listen, you are just turning up EVERYWHERE aren't you? I mean, what was WRONG wif those Purina peepuls? Sigh. Well, what's done is done. The Katie pillows are awesome. To bad Grandma wants plain boring solid blue pillows. Gosh as a Tuxie..I need to do this. *over shoulder* MOM?